“The Food Sense Program” lets you start making the immediate changes that are guaranteed to dramatically improve your child’s eating habits! The “Kid-Tested Recipe Guide,” A 52-page recipe guide that is packed full of delicious AND nutritious meals — most of which take only minutes to prepare! “The Food Sense Program” Fun With Food Activity Book: Includes simple food-based games for your toddler, a great “food art” project for your pre-schooler, and fun food contests for your school-aged child. 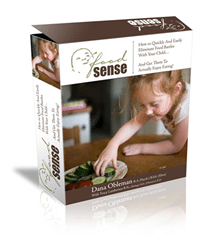 “The Food Sense Program” is backed by a 12-month, 100% ‘No Questions Asked’ Money-Back guarantee. “Thank you! We have had great success. Dinner time is no longer a power struggle, my children eat if they want or not and I have stopped stressing about it. “I have one word for you: salmon! Last week, my son ate salmon and steamed broccoli. Your program has been a success in two ways. It has helped my son be more willing to try new things and it has brought an end to mealtime stress. Thanks for the good advice!